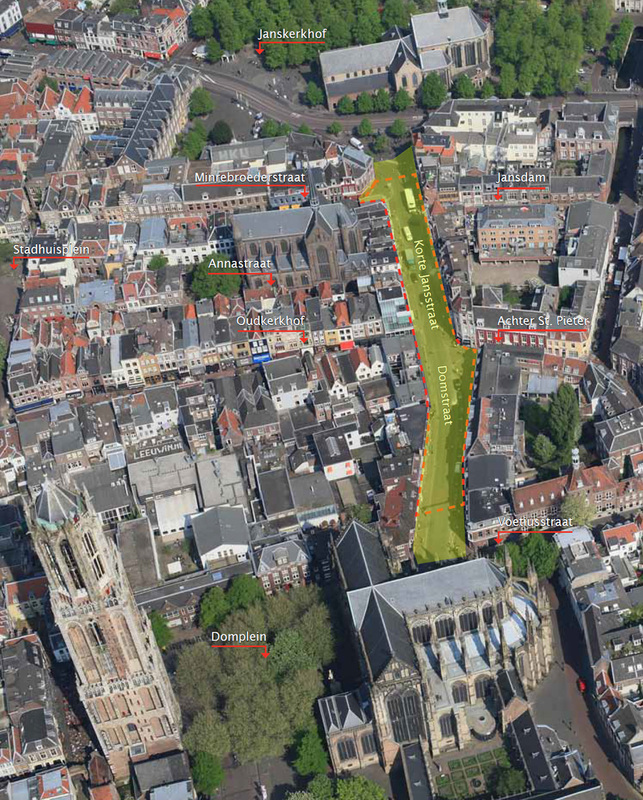 Utrecht has decided that the dominant types of transport in the old city centre should be cycling and walking. Streets which are due for maintenance are therefore reconstructed to reflect that policy. 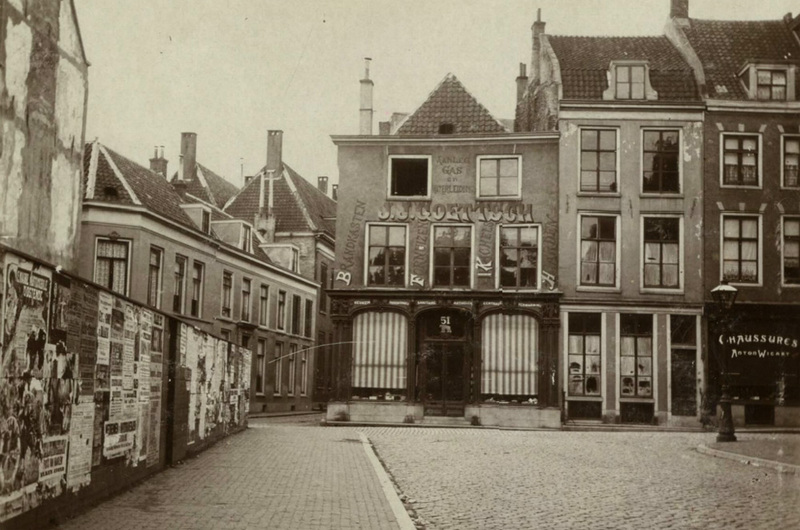 The newly reconstructed Domstraat and Korte Jansstraat show the city keeps word. These streets, which were clearly designed for the car in a different era, were changed into streets for people. This was done by drastically narrowing the main carriageway so the side walks could be widened significantly. The worn asphalt surface was removed and replaced by a much more friendly brick surface. Most parking spaces were removed as well. The area became a 30km/h zone and that means most traffic signs could be taken away. Before, the streets had priority over every side street and there were signs at every intersection to indicate that. In a 30km/h zone the priority is the default priority, which means that traffic from the right, so traffic coming from the side streets, has the right of way. Signs are not needed to indicate the default priority arrangement. All these measures combined send out the signal: motorists, you are a guest here, this is a people’s place now. The streets are optimised for walking and cycling. The two streets are a little over 13 metres wide (from one façade to the other) for the most part. The old carriageway was over 7 metres wide and with the added parking lane a total of 8.63 meters out of these 13 were reserved to motor traffic! That area was narrowed to just 5.5 metres. The new side walks are at least 3 metres wide, but 3.75 metres where possible. This creates room for a 1.5 metre wide area for outside seating for the many cafés and restaurants. Because many obstacles (such as the posts for traffic signs) could be removed, there is an open area to walk of at least 2.25 metres wide. This makes relaxed walking side by side possible. The height of the kerbs (curbs) is kept at only 5 centimetres to encourage crossing the streets where ever people would like to do that. This was done to enhance interaction between the two sides of the street. At the corners the already low kerbs are lowered further for people in wheel chairs, mobility scooters or with baby carriages. People cycling share the road with the remaining motor traffic. Separated cycling infrastructure is not needed in a 30km/h zone with a drastically reduced volume of motor traffic. The speed is enforced by the design of the street. The narrow carriageway (without lane markings), having to brake to give traffic from the side-streets priority and the brick surface, force motor traffic to slow down in a way no sign could. The surface is smooth enough for cycling and the drainage system is kept out-of-the-way of the area where most people would be cycling. So didn’t anyone object to the removal of 10 of the 12 parking spaces in these two streets? Oh yes, the merchants objected! Giuliano Mingardo, researcher of the Erasmus University of Rotterdam was present at a public hearing. 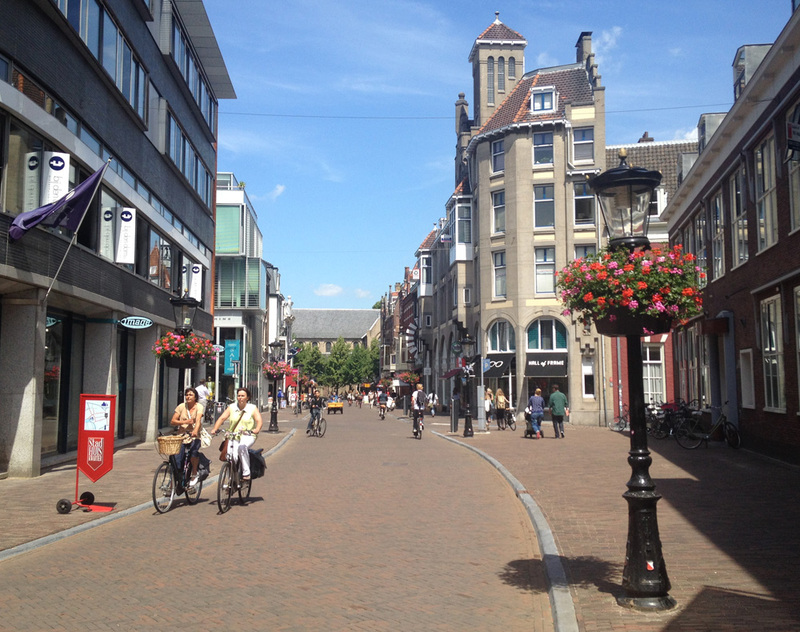 “I witnessed a lively discussion between shop keepers and the municipality of Utrecht. It was about 10 parking spaces in a small shopping street. I said: People, the Utrecht city centre draws millions of visitors per year, your 10 parking spaces are of no significance.” The city removed all but two remaining parking spaces, which are reserved to people with disabilities. Mingardo published the results of his researches last week. He investigated the shopping behaviour of 70,000 people in the Netherlands and found no connection whatsoever, between how much they bought, the parking fees and the parking possibilities. This was the case for smaller as well as for larger shopping areas. Another part of his investigations showed that merchants falsely believe over half their customers arrive by car. In reality the majority – 34% – arrived on foot, 26% came by public transport, 18% by bicycle and only 22% arrived by car. “This is not so strange,” said Mingardo, “because for over 60% of the people the main reason to visit a particular shopping area is the proximity to their homes”. 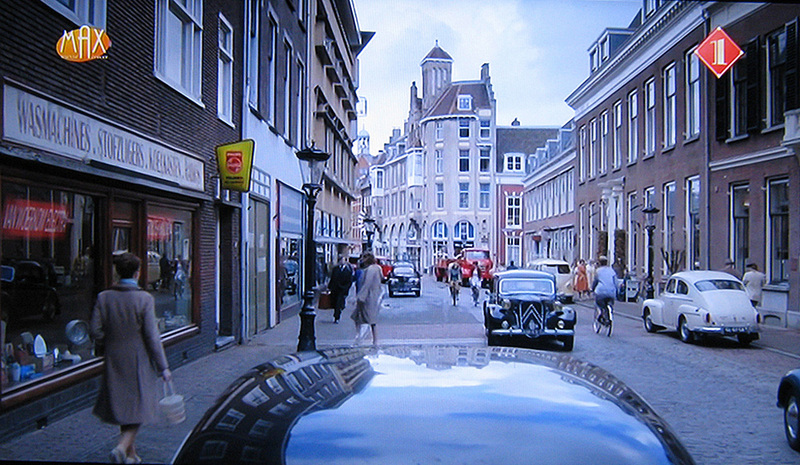 Still from the 2012 TV Series “Moeder ik wil bij de Revue” that was partly filmed in Domstraat. The story was set in the 1950s and the old-fashioned street design that was still there in 2012 was perfect to be used as a film set. The same location in 2013, before the reconstruction, shows the line of parked cars that disappeared after reconstruction. Cars could only park on that side because there is a – one way – bus route on this side of the street. In the 2014 situation, after reconstruction, the side walk has been widened (only a bit on this side, but very much so on the right hand side) and the parked cars have completely disappeared. In the foreground you can just see the brass strip marking the edge of the Roman Castellum constructed in the year 47 C.E. This Roman Castellum is considered to be the origin of the city of Utrecht. The two small streets in the city centre of Utrecht are very old. The south part of Domstraat even lies within the area of the Roman Castellum that was built in the year 47 C.E. It was one of the many fortresses the Romans built at their north border. Eventually this fortress and the settlement around it would evolve to become the city of Utrecht. The border of the castellum is marked in the pavement with a brass strip that lights up at night. 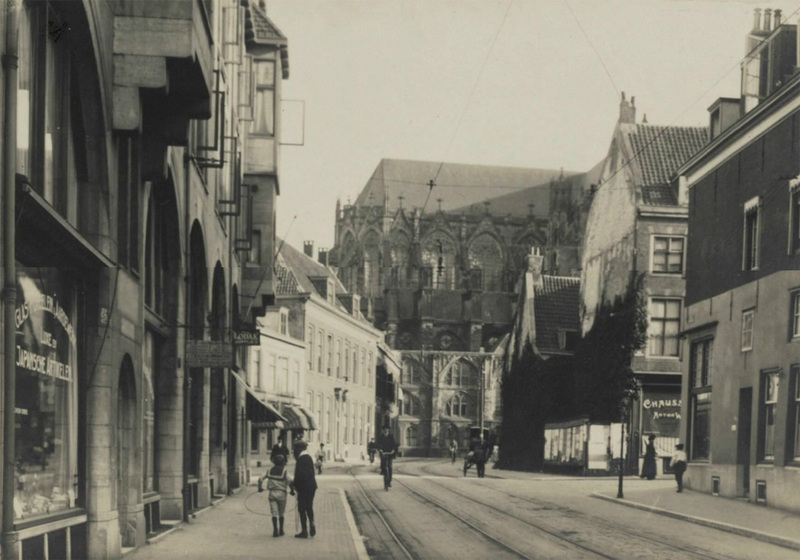 The mediaeval streets were so narrow that Utrecht widened them already in 1905, so that modern traffic – which at the time was a tram – could use the streets. But even ‘widened’ (at 13 metres wide) the streets are not capable to provide a smooth flow of today’s motor traffic. So motor traffic was diverted and discouraged to use these smaller streets from the 1990s on. By creating a maze of one-way streets and by turning this part of the city into compartments that cannot be traversed in a car. I have shown this system in an earlier video. Domstraat looking south in 2014 after the reconstruction. The carriageway is now narrower than it was in 1910 and the side walks are wider. The city now designated this street mainly for cycling and walking. Street design is all about choices and priorities. The Houses on the left hand side are still the same ones you can already see in the 1904 picture. The old-fashioned design of these two streets made them perfect for a TV series that was set in the 1950s. Filming took place in 2012. This film set gives us a glimpse of how the streets may have looked in that era. At the time the car was up and coming. 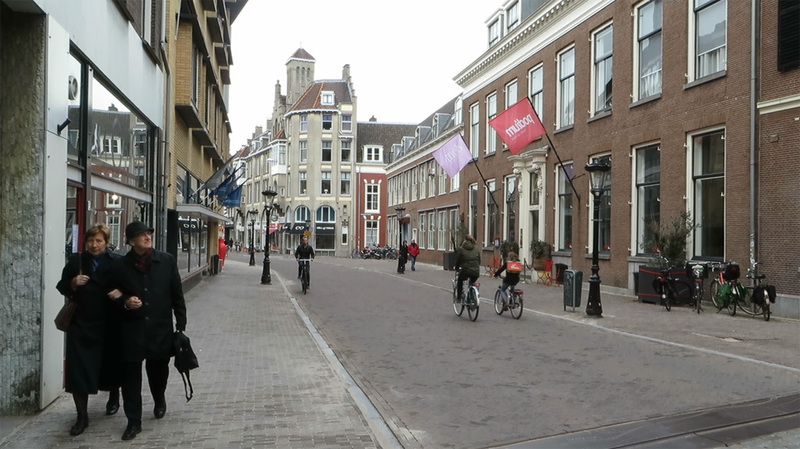 Today the reconstructions of these streets and many others in the city centres of the Netherlands make clear that it is no longer possible to have private motor traffic use the small streets that were never designed for it. 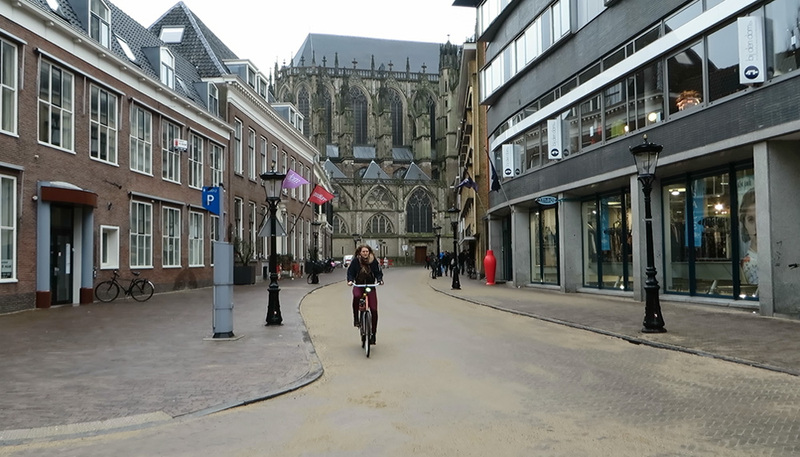 Most cities in the Netherlands made a clear choice to divert motor traffic around the city centres and to make these city centres much better places for walking and cycling to the benefit of all. 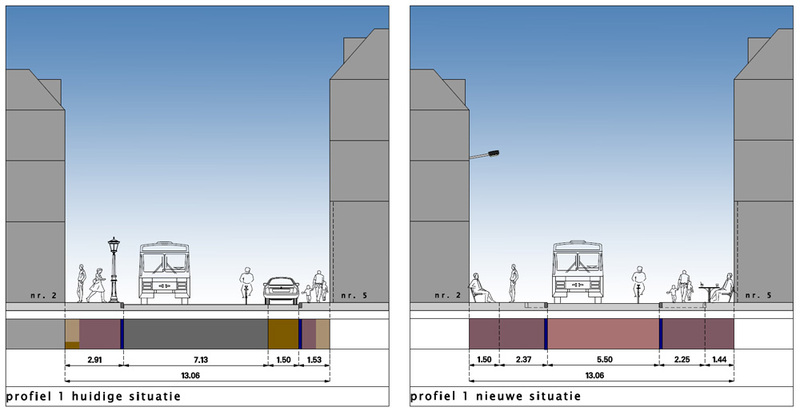 A portrait of Korte Jansstraat and Domstraat with a before and after comparison. A ride through Korte Jansstraat and Domstraat from beginning to end and back again, before and after the reconstruction. The before pictures were filmed in September 2013 and the after pictures between February and April 2014. Update: On the afternoon of the day this post was published I happened to be in this very street and it struck me how even more beautiful it looked on a sunny summer day. On the day this post was published the street looked like this! Domstraat looking south into Korte Jansstraat. What a beautiful transformation in the street. Also nice to hear at the very end the Dutch custom of chiming bells. I am more used to hearing change ringing. Wow. So good. I love the Netherlands. It truly is amazing and I cherish the months I spent there. The US is still stuck in the ’50s I’m afraid. Even in car-soaked Britain retailers tend to overestimate the importance of customers arriving in cars. The numbers are no doubt not quite so skewed against motorists here, but retailers tend to estimate that a large majority, ie >80%, arrive by car, when in fact a small majority actually do. I suspect that the complaints from small retailers in my community in affluent south east England derive largely from two factors – firstly, that they and their staff are “priced out” of the local housing market. They have to travel from more distant, cheaper residential areas and in England everything pushes them in the direction of scratching together enough money from their modest wages to afford an “old banger”. Access to parking, and its cost, is therefore important to them, and given that alternatives don’t really exist, I sympathise with their concerns. Secondly, to the extent that they get feedback at all from customers, I am sure that it is almost always “it’s so expensive to park here” or “I had a real problem finding a [free] parking space” and almost never how easy, or cheap, or available the parking is – human nature is to moan, not to praise. The hard fact here is that, while I constantly hear complaints about parking in the town, hard facts about parking charge revenues tell us that the most expensive parking in the town is twice as highly utilised as the cheaper sites, because people place more importance on convenience than they do on the 50 pence (€0.60) per hour price differential. Of course, our retailers are not examining the local government’s financial data on parking revenues, they are having daily conversations with customers, so it is no surprise that they are so misinformed. It boggles my mind that you can get around in your area without a car! Congratulations! I’m impressed. I took a tour of Dom tower in 1995. I thought the guide was mis-translating “tornado”. I’ve thought that all these years, until I read this post. the street is much more beautiful afterwards… the traders should be chuffed! Actually, I read an interview with a parking consultant in a national newspaper (can’t find it now) about parking in general. Apparently this consultant had been involved with this particular project, and he countered complaints from shopkeepers by pointing out that there are something like 15 million shopping trips to the Utrecht city centre each year, and their handful of on-street parking spaces are so not going to make the difference. Oh, never mind, that’s cited in the blog post. 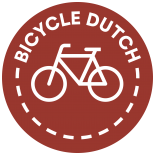 This entry was posted on 12 June 2014 by Bicycle Dutch in Original posts and tagged before and after, infrastructure, road diet, Utrecht.